Since February is the month of love, it seemed apt to talk about the heart. Not the kind usually drawn pierced with Cupids arrow, but the one that pumps blood around our body. While it may look more gruesome in anatomy text books than it does in the local card shop, the heart requires a lot of love, more than we sometimes give it. The most common heart breaker on our doctors lips is cholesterol. Too much clogs up our blood vessels, making them narrower and less elastic, stopping blood from circulating as well as it should. This kind of problem in our plumbing puts extra strain on the heart, linking cholesterol to heart disease and the risk of stroke or heart attack. This is why our doctors monitor it so closely. After age 40 we are encouraged to go for an MOT to monitor our risk of heart disease. If our cholesterol is high we may be offered statins to reduce it and the associated risks. Not everybody gets on well with statins. Side effects can include muscle cramps, joint pain and tiredness. This leads a lot of people to seek alternative methods of managing cholesterol, through diet or herbal medicine. At our clinic we help people with both. Managing cholesterol isn’t just about reducing your intake of fats and sugars. The way to a healthy heart is as much about eating the right foods as it is about avoiding the wrong ones. Try to consume more omega 3 from oily fish or try walnuts, pumpkin seeds and linseeds if seafood isn’t quite to your taste. Add extra fibre! Swap out white bread, rice and pasta for their wholegrain counterparts. Enjoy oats at breakfast and bulk out meals with vegetables, beans and pulses rather than breads and potatoes. Some people are genetically predisposed to high cholesterol and dietary changes alone may not be enough. 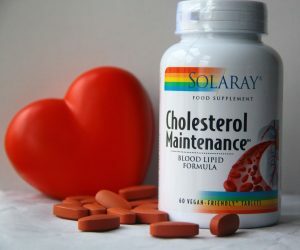 One of the remedies we have used for many years is Solaray’s Cholersterol Maintenance, a combination of Red Yeast Rice and nutrients that support the liver, the main organ involved in managing cholesterol. Red Yeast Rice acts like a statin by reducing the cholesterol produced by the liver. We once had a lady request a little time from her GP to try and manage her cholesterol on her own before resorting to statin medication. After two months using the Cholesterol Maintenance, her cholesterol dropped from 8.5 to 4.5 and both she and her doctor were very happy with the success. 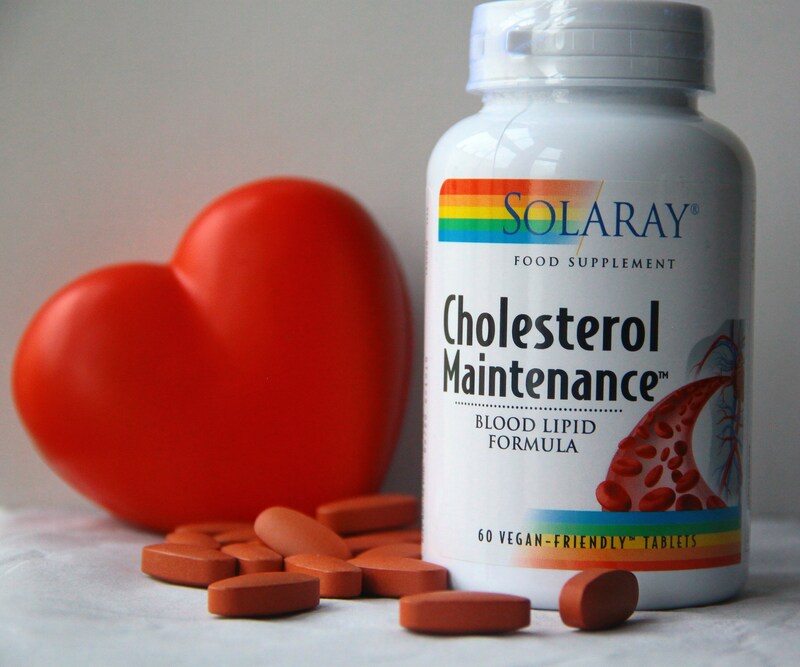 Since that day, we have regularly used Cholesterol Maintenance with similar success and many of our customers are sent in by friends, family and even some local GPs after expressing an interest in managing their cholesterol and the health of their heart. If you are already using statins or have been told by your doctor that you need to start using them, you may be worried that you’ll have to live with any side effects that might come along with your cholesterol medication. You’ll be happy to know that this is not the case and symptom free cholesterol management is entirely possible. Statins deplete our levels of co-enzyme Q10, something every cell in our body uses to make energy. Restoring levels of Q10 can make a huge difference to how comfortable we are when managing cholesterol with medications. My favourite success with Q10 and statins was with the owner of a beautiful collie dog who frequents our shop weekly. He was very upset because he already suffered with arthritis and found that his joint pain had worsened and his muscles had begun to ache since starting his cholesterol medication. Walking his collie daily kept him moving and stopped what he described as ‘his joints seizing up’, but since using the statins his energy was lower and he wasn’t able to keep up with his previous routine. After three weeks of supplementing with Q10 he popped in to visit us, letting us know that he was back to normal with a very happy looking dog by his side! A healthy heart really does provide a wealth of benefits and is well worth that extra bit of love. Believe it or not one of the main differences between those who get a good nights sleep and those who do not is their belief in their ability to sleep. Basically people who can get a good nights sleep, believe that they WILL go to sleep when they go to bed. Those who struggle, often go to bed worried they will NOT get a good nights sleep, or convinced that tonight, as many others they are going to struggle. This negative belief often becomes self fulfilling, so one key thing to do is to change your mind set. There are also a couple of natural remedies that can be helpful including a herbal medicine called Dormeasan. Made with calming herbs valerian and hops Dormeasan will help you to relax more, making getting to sleep and staying asleep easier. I often suggest that this is used with an amino acid called Theanine which is said to help improve the production of your alpha brainwaves, calming down an overactive mind. This combination has proven to be very popular with our customers over the years, it is also something that I have used personally during times of stress, when I have found it difficult to get to sleep. It tends to work quite quickly, with most people reporting an improvement in their sleep patterns and their ability to sleep within a week. 1. Make sure that you do not drink anything with caffeine in it, such as tea, coffee or cola, after 3pm. Even if you don’t really feel the effects of caffeine, it can seriously impact on your ability to get a good nights sleep. 2. Try not to do any work or anything that excites or stresses your brain too late into the night. Have a cut off point and stick to it. After this point only engage in activities which are relaxing and calming. 3. Bedtime routines are not just for children! Engaging in the same routine before bed each evening can really help your brain to understand that now is the time for rest and sleep. 4. Don’t stare at bright lights and lit screens when trying to switch off. If you are going to look at your phone or tablet ensure that the lights are turned down as far as possible and that you are only looking at or reading things that relax and calm you. 5. Try to go to bed when you are tired! This is when your system is ready to sleep, pushing on past this will lead you back to wakefulness and it will be around an hour before you are sleepy again. Hopefully all this will help to ensure a good nights sleep! One problem we are often asked about is recurrent cystitis, I had a lady in today asking whether the was anything that we may be able to suggest to help her find some relief from the recurrent cystitis that has plagued her for the majority of her life. The good news is that recurrent cystitis is one area where we have had a lot of good results over the years so I was able to send her off with some tried and tested remedies and a fair amount of confidence that she may find some relief. One of the first herbs we tend to reach for when trying to help people suffering from cystitis is Uva Ursi. This is because a lot of the herbal texts tell us that Uva Ursi has an effective anti bacterial action which specifically targets the bladder and this claim would certainly be backed up by the number of customers who have told us over the years that Uva Ursi has helped stop a Urinary Tract Infection in its tracks. Indeed many people, myself included have seen symptoms clear up within 24 hours. Whilst the Uva Ursi does seem to be very helpful for the infection itself the other things we need to look it is the recurrent nature of the problem. What we have found over the years is that many people stuck in a cycle of recurrent cystitis really find benefit from using a good probiotic supplement. This is because when you suffer with cystitis you often take an antibiotic to combat the infection. The problem with this is that as well as killing off the bad bacteria which cause the infection the antibiotics also kill off the good bacteria which are needed to keep your urinary tract healthy. Without decent levels of the good bacteria, the bad, infective bacteria can grow back leading to another infection, more antibiotics, less good bacteria and so the cycle goes on. The theory behind taking a probiotic supplement is to replace all of those good bacteria within your urinary tract and hopefully help to prevent the infection returning. We have seen some very good results with this approach over the years but one lady in particular always sticks out in my mind. She had been suffering with recurrent cystitis for over 5 years, with the infections becoming almost constant. As a result she had spent six months on permanent antibiotics and at the time she came in she was feeling really lousy and the infection was returning again. We put her onto the Uva Ursi combined with a really high strength probiotic – Solarays Mightidophillus12. We also suggested that she cut sugar out of her diet as much as possible as we believe that sugar feeds the infectious bacteria. She took our advice and was delighted to report a month later that she was free on infection for the first time in years. This happily continued to be the case as well and I can report that this lady had been free of infection for over a year when I last saw her. I thought I would have a look at the other type of bug that can ruin a holiday – tummy bugs and talk about preventative measures we can take to keep our guts in a healthy state whilst on holiday. For some people a change in food or water can trigger a stomach upset. Others will often succumb to a stomach bug on holiday and let’s face it, losing a day or so of your holiday tied to the toilet is no fun. So what can be done? Well the main thing that you can do is make it harder for those bad bacteria which cause stomach infections to get a hold and the way we can do this is to take a good bacteria supplement before and during our holiday week. I always used to get a stomach upset on holiday, my husband joked that we had to go away for ten days so he could be sure that I would have a weeks holiday and two or three days with some kind of tummy issues. However, after a particularly bad trip to Thailand a number of years ago now, I decided to start taking a good probiotic the week before I went on holiday and to keep taking it whilst I was there. The product I use is Higher Nature ProBio Daily. I chose Higher Nature ProBio Daily, because it does not been to be kept in a fridge and will not be destroyed by heat. I take 3 of these a day for the week before we go anywhere and continue to use it all the time we are away and I have to say that it has made a huge difference for me. In the years that I have been using Higher Nature ProBio Daily I have not suffered with one tummy bug in holiday – making family get aways much more fun. The other step I have taken in to also take a Digestive enzyme away with me. The one I use is SuperGest. The reason for this is that many of us in our daily lives tend to eat the same foods each week. When we go in holiday however we get adventurous, trying new and sometimes exotic foods which our digestive system is not used to or prepared for. This in turn can cause some grumbling and upsets from our digestive system. So when we go out to eat on holiday, and even in this country I always take a few SuperGest with me. If I choose a food I would not normally eat, I always now take a couple of SuperGest with that meal. This has helped prevent the tummy aches, wind and bloating that can occur for many after eating new foods and means that I can enjoy eating new things without any fear of repercussions from my guts! I am going to look at something that can ruin the enjoyment of a holiday, especially for those people like me with tasty blood – biting beasties. MAKE YOUR BLOOD LESS TASTY! There are lots of arguments about what causes some people to have tasty blood and many theories about things that might be helpful if you do. One of the most popular home remedies is to eat marmite – now there may be something in this theory! Marmite is a natural source of Vitamin B1 and Vitamin B1 – also know as Thiamin – can actually make your blood smell less tasty to the likes of midges and mosquitoes. The good news is that to get this benefit you don’t actually need to eat marmite, which I am sure is a relief to some. Even those that do like it, may not want to eat it every day. The alternative is to take a Vitamin B1 supplement, this will be more concentrated than the marmite and we have been told by many, many people, myself included, that this also seriously reduces the amount of bites you will suffer from. In addition to the vitamin B1 I would still use a good insect repellant. However, I know that I do not want to spray strong chemicals onto my own skin, let alone that of my daughter. Which is why I was delighted last year, when our herbalist Nicola, made a brilliant Insect Repellent for us and all our customers. It is all natural, safe for all ages and actually with the ingredients used may even be good for the skin! This insect repellant combines Neem, Tea Tree and Lemon Myrtle, it does not smell disgusting and I have to say from my experience with it last year it seems to be extremely effective. Neem particularly is an enemy to all insects, the neem tree is apparently one of the only ones that a locust will not eat. Neem has also been shown to help kill head lice and fleas and to repell even the rampant Scottish midge! I used the Insect Repellent last year in France and there were a lot of bugs around. Now as I said I have tasty blood and in my family I am usually the one kept awake nights with itchy bites. This was not my experience last year using the B1 and Nicolas Insect Repellent – in fact, I did not get one bite, whilst my husband, who does not usually get bitten, did not use either and did end up with a number of nasty bites! So if you have tasty blood and are often plagued with bites then this combination of B1 and our very own Insect Repellent could be just the thing you need to feel as comfortable, and yes as smug as I did last year! I can’t believe how quickly the last year has passed and that I am again writing about the fact that we are heading towards the main holiday season. The first thing I am going to have a look at this week is the flight – or more specifically, the fear of flying or flying phobia, which can affect many people’s enjoyment of flying. There are a couple of things that could be extremely helpful in this situation. Firstly, to help with a simple anxiety of flying, my favourite thing to suggest is something called Theanine. We have found over the years that Theanine can just help to take the edge off anxiety and worry for many people. One girl in particular sticks out in my mind. She had suffered with an anxiety around flying for years. It had never stopped her going away, but she did struggle every year. We suggested that she try the Theanine to try and help reduce the sensations of anxiety and the thoughts that rushed through her head. She did so and came back in after her holiday to gleefully report that it had made a huge difference to her as she hadn’t had to spend that last few days of her holiday dreading the flight home! I would therefore say that for those who feel anxious about flying that Theanine could be a great thing to try. There are those however who suffer from a real flying phobia. Just the idea of flying makes them almost have a panic attack and actually getting on the plane can be quite traumatic for them. The good news is that I have been having some great results for this, using a hypnotherapy technique called Rewind and Reframe. Already I have had a few people getting onto flights with no issues and one girl who tells me that I have helped her get on a plane for the first time in years, with her family and go on a fantastic holiday, something she had not been able to do before. The way it works is this, at some point, your brain has identified a plane as a scary thing, something which threatens you. After that point, every time you put yourself into that position it send messages to you that you are under threat – leading to extreme feelings of anxiety and potentially panic attacks. What hypnotherapy can do is to disrupt this pattern – Rewinding it, this is usually done about a week and a half to two weeks before a flight. Following on from that we create a new pattern for your brain, a nice one – Reframing the pictures associated with flying. This is ideally done a day or so before you fly. This combination has been an extremely successful one for many people trying to deal with phobias and would offer a real solution to a flying phobia, to make a happier holiday. If you want more information on this please email me: jenny@clearyourhead.co.uk. Or see my website for more information. Last week I wrote about using Omega 7 for dry eyes and told the story about a lady who had found that her terrible dry eye symptoms had significantly reduced after only a week of using omega 7. This week I am going to carry on focussing on the eyes (excuse the pun) by looking at natural remedies which support healthy vision.Looking at ways to support the vision is something that a lot of people worry about, for obvious reasons – after all we only get one set of eyes don’t we? There are as always many options available to help support healthy eyes, but the one we have sold for years and that people come back for time and again is Natures Aid Lutein Eye Complex. This little formula has an army of fans with our loyal customers some of whom have literally been buying it for years. The fact that they have continued to come in and buy it so regularly means that we have often taken for granted that it must be helping them. Recently though it was lovely to hear from one gentleman who had been using it for over three years. He had initially come in to purchase the Lutein Eye Formula after being diagnosed with macular degeneration. He had seen a television program which had reviewed the use of Lutein for the eyes which come to the conclusion that lutein could help to look after the vision and may even help to improve the eyesight. We told him about the Natures Aid Lutein Eye Complex explaining that it provided not just the Lutein he was looking for but also the supportive nutrients like zinc, vitamin A and alpha lipoid acid, all of which had also been shown to be protective of the vision. He had decided to give it a go and has been buying it ever since. A few weeks ago, remembering how long he had been coming in to replenish his stock we asked him if he was satisfied with the product. He told us that actually he was delighted with it, which was why he had continued to come in for it and would be continuing into the future as well. The reason for his joy was because in the three years he had been using the Natures Aid Lutein Eye Complex his vision had not deteriorated at all! This is amazing as obviously anyone who has been diagnosed with macular degeneration expects their vision to deteriorate. We always hope that using products like Lutein will help to slow that deterioration down, but to knowthat for this gentleman at least it had actually seriously delayed any deterioration at all was wonderful. Sometimes it is so easy for us to forget about things that we have sold for years, that it is lovely to be reminded why we have them and why they are so popular among our customers. Dry Eyes – how nature could help. It’s aways lovely to have a new success story to share with you. This week I want to share with you a story about a lady with terrible dry eyes. Now dry eye is something we have only really been looking at for the last two or three years. Before this I had no idea how much of a problem it was. It was only when my own mum started to suffer that I did some research into the ways that natural medicine might be able to help this condition. Those that read this column regularly might remember that I discovered that Omega 7 Supplements have been found to be helpful to those suffering from dry eye and happily my mum was no exception. After a few weeks of using the Omega 7 her dry eye symptoms had cleared up and the even better news is that she has had no problem since. The symptoms my mum had been stuffing from included a constantly watering eye as her eye attempted to lubricate itself using tears. We saw a lot of people after I wrote that story who were suffering from the same thing’ which is when we realised what a big problem it was. Luckily, a majority of the people that came in to try the Omega 7 after reading about my mum also reported a relief from their symptoms, which was wonderful. The the other week another lady came in. Her dry eye problem was actually much worse that my mums had ever been. This lady had progressed to the next stage of dry eye, there were no tears lubricating her eyes, so her eyes felt constantly sore and very dry. It was so bad that she said it felt as though her eyelids were sticking to her eyeballs. All this despite the fact that she was using eyedrops regularly to try and help ease the problem. We spoke to her about the omega 7 and told her about the other people who had used it. We said to her that because her problem was so bad, it might take longer for her to notice a difference, but it was well worth a go. What was amazing for us to see and wonderful for her to report was that actually she had quicker results that anyone we had ever seen! After only a week of using the Omega 7 this lady was in to buy more – she didn’t want to risk running out because she had noticed remarkable improvements in that short time! At first we were surprised that she had had such a quick response, but really thinking about it, when your body really needs something and you provide it, the response can be very quick and that is what we saw here. I have gained a lot of faith in the use of Omega 7 to help people struggling with dry eye issues over the years, but this response in a lady who was suffering so badly has really strengthened that belief. The other day a gentleman in the shop was complaining that I do not feature enough articles specifically aimed at men. I am sorry for this. Many of my articles are appropriate for both men and women, but I do know that there are probably a large amount of articles that are aimed at women’s hormonal problems. So to try and redress the balance, this week I am taking a look at the Prostate gland. One of the main health issues that can affect men only, as they age. The prostate is a small gland found in men. It sits just under the bladder and with age, it has a tendency to enlarge. This condition is commonly referred to simply as ‘an enlarged prostate’. The medical term for an enlarged prostate is benign prostatic hyperplasia (BPH). The use of the word benign is significant – it indicates that the condition is not life-threatening. The enlarged prostate is an increasingly common problem as a man becomes older. Although an enlarged prostate is not in itself a life-threatening condition, it can give rise to a number of inconvenient symptoms which if severe enough, can affect your health and quality of life. As the prostate enlarges, it presses against the bladder and interferes with the way it works. This gives rise to a number of symptoms relating to bladder function and urination. If you suspect you have an enlarged prostate gland, the most important thing to do is to have the diagnosis confirmed by your doctor. Do not, as many men do, suffer in silence! Once you have confirmed that you have an enlarged prostate there are a number of things you can do to help yourself. Foods such as broccoli, brussel sprouts, cabbage and kale appear to be beneficial to eat, as are foods rich in zinc such as pumpkin seeds, pine nuts and shellfish. As well as dietary changes, it could be worth while seeking out a good Saw Palmetto extract, like Vogels Prostasan. Saw Palmetto berries have been used for many years as a herbal treatment for symptoms of an enlarged prostate and Vogels Prostasan now has a traditional herbal medicines licence for the treatment of the symptoms of an enlarged prostate. We have many customers who use this product and swear by it, including one man who was previously getting up 4-5 times every night to pass water, who now tells us he often goes through the night without getting up now! Another gentleman tells us that using Prostasan has enabled him to go on coaching holidays with his wife again, something he had stopped doing due to the frequency of his bladder.